A peek into the insane life of a wasted genius and a celebrity in the making!! Change is good, but not so good. Our lives are merely an unending sequence of uncontrollable changes silently unfolding before our eyes when we were busy continually trying to control the change or change the control. At times, the most comforting thing in the world is to see something and think, "Ha! Things have not changed and I don't have to do anything about it". That forlorn feeling, that forgotten connection, that unbreakable thread, that unmistakable connection between your life that was and the life that is, is sufficient to take you mentally back all those years and force a grin on your face even if you are skipping lunch and working late on an eventually inconsequential task. One of my friends used to say long time back, "You don't like Madras. You either love it or not". True that. Beyond the madness and the rush, the city does exude a very subtle romance that is felt only by someone who is in love with it. This city still has so many things intact that can make me harp on and on about it. Dear Madras, you have grown bigger than I had known, you may have become sufficiently cosmopolitan, auto drivers may have started to talk Hindi, mini skirts may no longer be applicable to the '5-12 ages' group, multinational companies may call you their home, those multinationals may also install Italian coffee machines in their pantries, but, they can't change you! Only in Chennai will you see this. 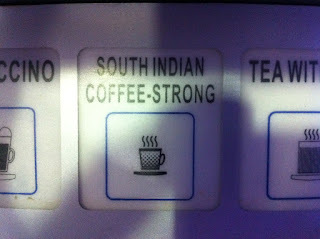 Let the Cappuccinos and the Lattes enjoy the pleasurable company of a quintessential South Indian Coffee-Strong. Let them go back to the world and narrate how awesome the South Indian Coffee-Strong feels, especially to someone who calls Madras a home and is struggling to find foot in his life! Love you, my dear Madras. There is A. There is B. A is married to B. A has three siblings - C, D and E. B has two siblings - F and G. C, D, E, F and G are assigned random genders but it helps to be have a majority of females. Since A is married to B, it is a high probability that F is married to D! C is married to H, an outsider to the original family. G is most probably a male and is currently unmarried. A and B have a couple of kids, I and J. D and F also have a couple of kids, K, L and M. G is in love with J and she knows that. Their families have agreed to that. But K is elder to J and she wants to marry G.
I is the most undereducated in the family and he married someone, N, commensurate to his status and they have a kid O. Then there is this guy, P, who is sincerely in love with J and she knows that. P also has absolutely no chance of landing J, and she knows that as well but doesn't seem to do anything about that! 99% of the time P has a really sick and slowly dying mother, Q.
L and R are sincerely in love with each other. As if one more twist is required in this story, S wants to desperately marry L and her brother T wants his sister M. Needless to mention, R is excruciatingly poor and S is outrageously rich. L has a group of friends - U and V. V also loves R, in spite of knowing that she loves his friend L.U know it, but deems it absolutely unnecessary to discuss this trivial issue with L. R has a step mother W, who is always plotting her downfall, and a step sister X, who empathizes with R and goes against W. I don't know where, but somewhere in the middle of things there are two antisocial elements, Y and Z, trying to kill someone or the other. Somehow, just somehow, they always fail to do their job and are promptly excused every SINGLE time. Now you would want to know why R has a step mother and what happened to her father. But as you may have noticed, I have run out of the English alphabet! Probably next time I will try to rewrite this post with Tamil alphabet. I can create 247 characters that way. Now you tell me, which part of the story did you not understand? I started this blog because I wanted a space to express my ideas and make fun of my life. Eventually I fell in love with writing and this blog has been alive for almost 3 years now. But, as it is well documented in this blog itself, the love has been anything but constant. Even after repeated vows to blog regularly, I disappear into periods of emptiness. There would be 3 posts in draft mode, but I won't find a single word more to write! It is technically called a Writers block, but it is basically a lack of love. Now, will the same phenomenon happen when I am in love with a person as well? I don't know. There will be days, a lot many of them, when you feel like your better half means the world to you. But, will there be days when you realize that the world is majorly made of mud, dust, pollution and non-potable water? Being the engineer that I am, I cannot resist the temptation to ask this question. Can love also be reduced to an equation, Love (t) = fn (t, 1/t, Sin t, Cos t), with 't' being the time variable? Don't think my idea is outrageous. If numbers are allowed to be irrational, then why not this? Just imagine the possibilities. For a start, you can differentiate the equation and figure out the slope of your love curve! You will know when your love will maximise or minimise and you can act accordingly. You can integrate the equation between two time frames and find out exactly how much you will love a given person, correct to two decimal places. How simple would setting priorities become now? Excel will help you choose between marriage and career. It does not come without a catch though. Mathematicians have a concept called 'indeterminable'. You can have an equation describing a quantity, but you cannot determine it. Mathematicians are cool, like that. What if we figure out the equation for love and then realize love, and therefore God, is indeterminable. I would rather prefer my God to be indeterminable. How about you? Antithesis. The highest degree of complexity in it's most simplified form. Add up all the oxymorons you know and you get me! I write to express my thoughts. Nothing else. I am a wasted genius (B.Tech) and a celebrity in the making (MBA). Both degrees influence my writing to various degrees! The Life @ NITIE Blog !